On March 19th, POSCO kicked off a 3-day exhibition for SsangYong Motor’s new sport utility vehicle, VIEWtiful Korando at POSCO Center in Seoul. The two company’s joint promotion was part of the steelmaker’s campaign, ‘Business with POSCO.’ The campaign objective highlights POSCO’s mutual growth with its partners, clients, and suppliers, thereby strengthening the overall health of the business ecosystem for industries in Korea. Through this joint effort, POSCO hopes to help lay the groundwork for the successful launch of the VIEWtiful Korando just like SsangYong’s two previous models, Tivoli and G4 Rexton. The strategic partnership of the two companies allowed SsangYong to apply high-strength steel plate (340 Mpa or more) to 74% of the bodywork of the new model from the early development stage. Among this 74%, over 46% is composed of Advanced High Strength Steel (AHSS: 590 Mpa or more). As a result, VIEWtiful Korando achieved the overall lightweight in the body, improving fuel efficiency. Furthermore, SsangYong’s self-test showed that the VIEWtiful Korando had met the safety standard set by the Korean New Car Assessment Program. 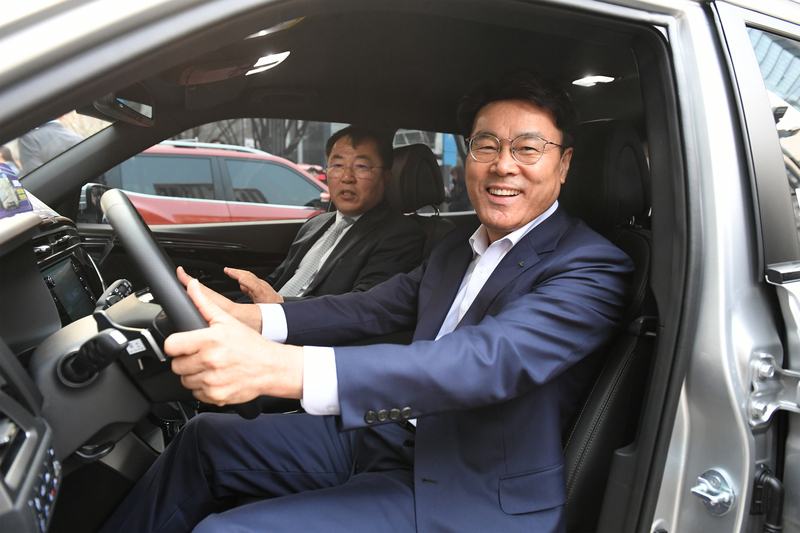 Together with the SsangYong’s Vice President Byung-Tae Yea, POSCO CEO Jeong-Woo Choi participated in the test-drive event of the brand new VIEWtiful Korando which massively applied whole new cutting-edge options that the automaker is utilizing for the first time in in eight years. Endorsing the two companies’ ‘long cooperative partnership,’ Choi pledged POSCO’s ongoing support for SsangYong so its client can advance into the global stage as a top SUV maker. 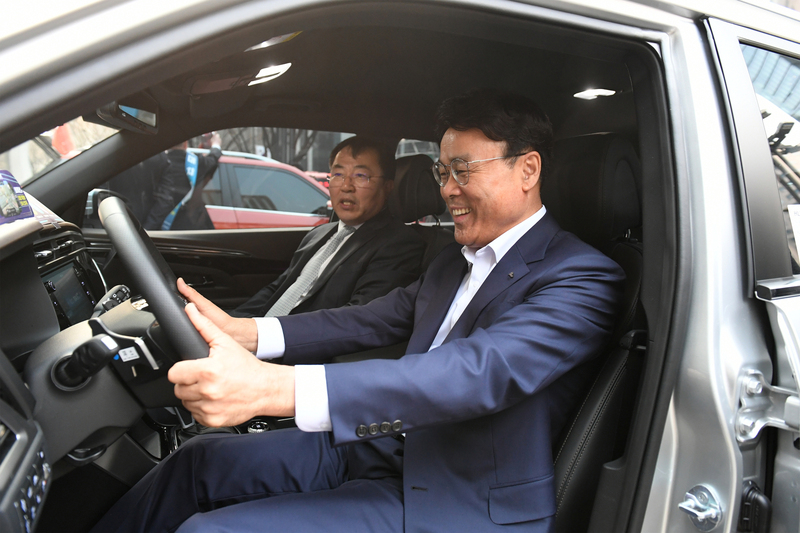 ▲ POSCO CEO Jeong-Woo Choi at the test drive event of SsangYong’s VIEWtiful Korando, together with the automaker’s Vice President Byung-Tae Yea. 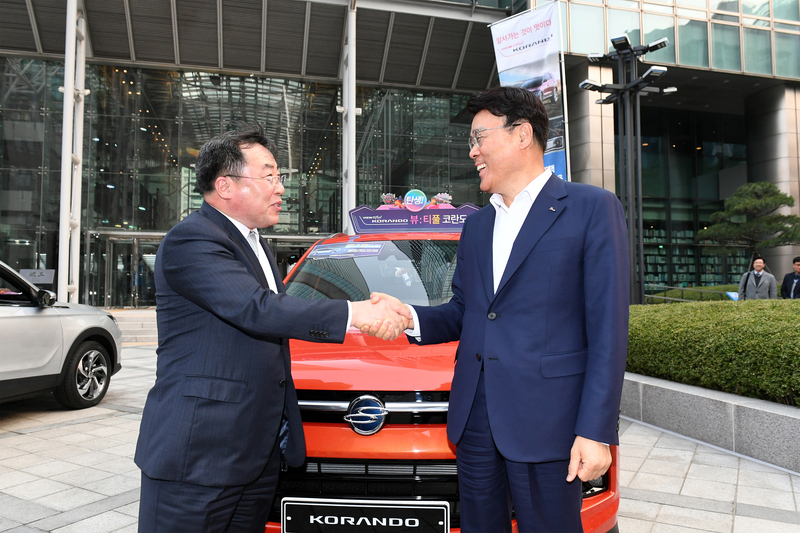 ▲ POSCO CEO Jeong-Woo Choi at the test drive event of SsangYong’s VIEWtiful Korando, together with the automaker’s Vice President Byung-Tae Yea. ▲ CEO Jeong-Woo Choi (right) shaking hands with the SsangYong Vice President Byung-Tae Yea (left).